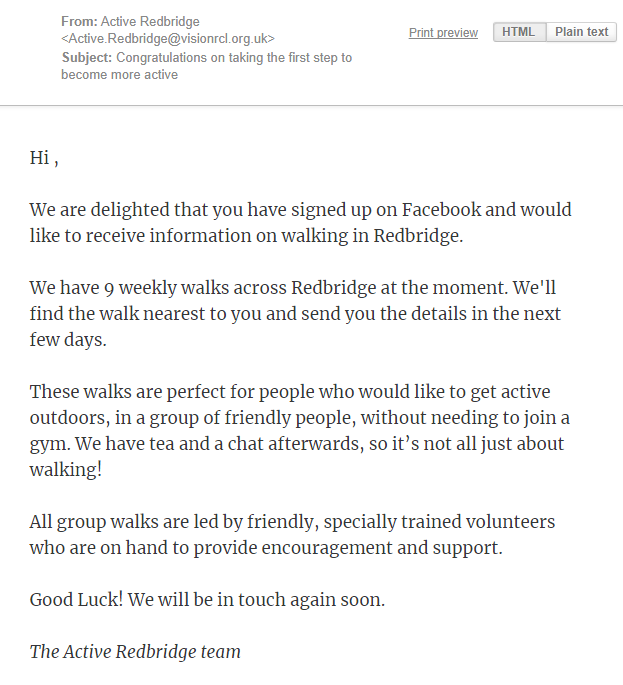 These are the results we got running a Facebook lead ad campaign in Redbridge. We’ll cover how we did it in a bit, but first, let’s look at the statistics. 72% of the general population are in work whereas 59% of people with LTCs are in work. Only 35% of people with a mental health condition are in work. Of the people who report that they live with long term conditions, 24% have two LTCs and 20% live with three or more LTCs. 64% of people living with long-term conditions, at present say they feel supported, so there is room for improvement. Lifestyle factors account for 80% of long term conditions in the UK. Physical activity is a lifestyle factor in disease and premature mortality, along with diet, smoking and alcohol. 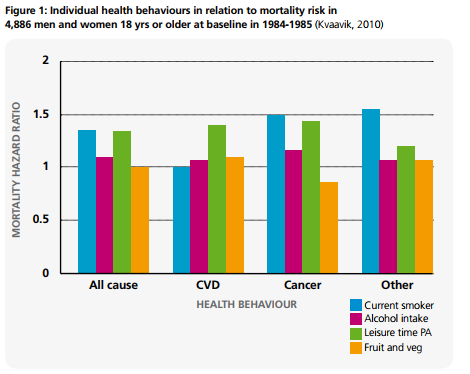 A UK study following up 4886 adults for 20 years looked at the individual risk of each of four main lifestyle factors (Kvaavik E, Batty DG, Ursin G, MD, Huxley R, Gale CR, Influence of Individual and Combined Health Behaviours on Total and Cause Specific Mortality in Men and Women The United KingdomHealth and Lifestyle Survey ARCH INTERN MED/VOL 170 (NO. 8), APR 26, 2010). The researchers calculated how much the risk factors contributed to all-cause mortality, cardio vascular disease (CVD) and cancer mortality based on each health behaviour. For physical activity the population was divided into those completing more than 2 hours and less than 2 hours of leisure time activity per week. In Figure 1 the results show that smoking and inactivity have equal all-cause mortality hazard ratios but that for cardiovascular disease physical inactivity is the most important risk factor. Allender et al (Allenda S, Foster C, Scarborough P, Raynor M, The Burden of Physical activity-related ill health in the UK. J.Epidemiol, Community Health 2007; 61;344-348.) calculated that the direct cost to the NHS of physical inactivity in England was £1.06 billion per year. This is acknowledged by the authors as being an underestimate since arthritis, prevention of falls and the social care required to look after the elderly who have become dependent due to inactivity are not included. It also does not include the large burden on mental health. Table 1 shows the costs of inactivity for each disease area. This is further adapted for London which has 6.1 million adults or 14.7% of England’s adult population of 41.4 million adults. The above statistics and many other research reports show just how important physical activity is for prevention of these conditions as well as improvements in quality of life for people already living with long term health conditions. It is hard to engage these people into physical activity because not only do they have psychological barriers like most of the population, but also physical barriers caused by the conditions. In the past most of engagement work has been done in person through GPs and other health professionals with various levels of success. We decided to take a different approach and use digital marketing to engage these people. According to a study of the market, 71% of 55-to-75 year olds now own an app-capable handset. And about 50% had Facebook installed compared to a 70% figure for all adults. Read full article here. We already ran successful campaigns for over 50s in general and people with disabilities, so were pretty confident we could engage this audience too. We ran the campaign in the first few weeks of January. As it was early in the new year people had a strong desire to become more active. 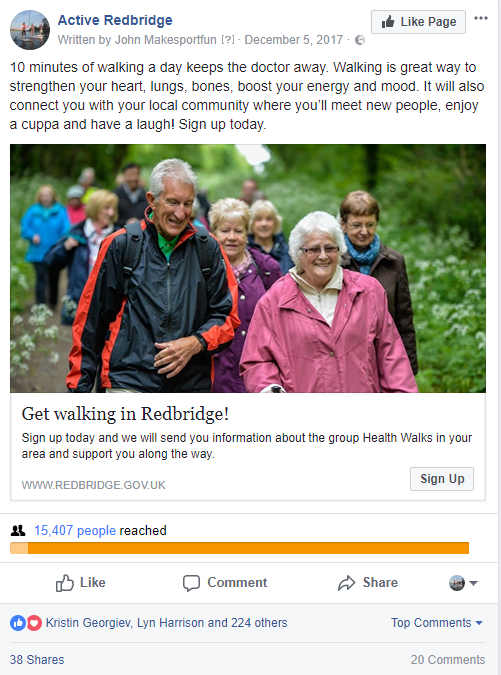 With a £600 ad budget we managed to reach more than 14,000 people living across Redbridge and 300 of them signed up to receive more information about the walks. That’s £2 per person with long term health condition! “I wasn’t convinced that Facebook Ads would work for engaging a hard-to-reach group like those with Long Term Health Conditions. But the response has been amazing. I’ve just sent John through the list of new walker forms, and normally there’s just a few – but this time there’s a huge stack of them. Facebook is able to collect information beyond what you offer up on your own profile. It can read cookies on other sites you visit. All of this adds up to a lot of information. Cancer related interests were National Breast Cancer Awareness Month, Support The Fight Against Breast Cancer, Macmillan Cancer Support, Pink ribbon etc. Mental health interests were – Mental Illness Awareness, BP Magazine for Bipolar, World Mental Health Day etc. Diabetes – Diabetic diet, Diabetes Health, Diabetes UK, The Diabetes Awareness Ribbon etc. We targeted men and women 55+ living in Redbridge. We had a great offer – We’ll send you information about the Health Walks in your area. We used an image of people our audience could relate to. We included a Call to Action, the next thing you want them to do. Once the campaign started we had to deal with all the enquiries that come in! In the first seven days we had 190 sign ups and the next eleven days 110. We made sure that people were followed up with as soon as they signed up. No matter what time someone filled out the lead ad form, we wanted them to get a confirmation letting them know that they have registered successfully. Therefore, we set up an automated confirmation SMS message and email that people received immediately after signing up. We collected people’s postcode when they first signed up so we could check which walk was the nearest to them and we sent them an SMS message with the details. We wanted to find out how many people actually attended a health walk, so we analysed the new walker forms and registers as well as sending an SMS survey to everyone who registered. The new walker forms showed that 50% of new walkers came from Facebook. The SMS survey had a great response, 60% of people replied answering yes or no. Whereas if you survey people by email you can only get on average a 10-15 % response. This led to over 50 new walkers in the health walks in January and February so far! A fantastic result. Luke Martin and Louise Sheridan from Walking for Health have been responsible for developing and running a series of Facebook ad campaigns that have engaged over 20,000 people interested in walking groups. They focused on people in England aged 50+ who have demonstrated an interested in cancer charities/support/awareness because they are funded by Macmillan Cancer Support. If you’d like to hear the interview with Luke and Louise then click this link to get the replay.